ArtPrize artist and spoken word poet Kane reacts to the critics comments on her entry and about bringing poetry into a typically visual art arena. Art critics discussed 'Why These Finalists? Part 2' at the ArtPrize Studio at the ArtPrize Hub Tuesday night, October 3, 2017 on 41 Sheldon Boulevard SE in front of a live audience. The Rapidian and GRTV interviewed a variety of audience members after the event to get their reaction to the critics thoughts on the public's and jurors' 3D and time-based choices in the Top 20. 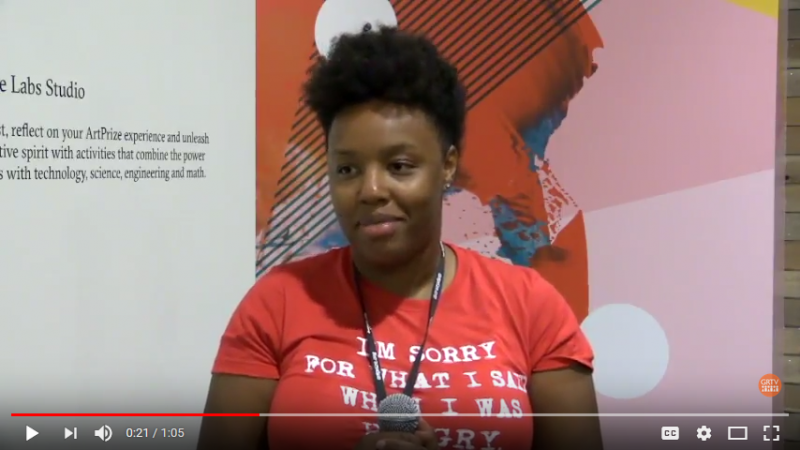 ArtPrize artist and spoken word poet Kane reacts to the critics comments on her entry and about bringing poetry into a typically visual art arena.